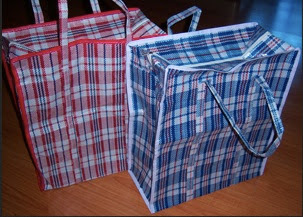 I was thinking about these bags a little while ago and wondering what to call them. I was thinking about them because I don't see them as much as I used to. They used to be everywhere and now they're not so much. In summary, these bags are mostly associated with old people, poor people, and immigrants. 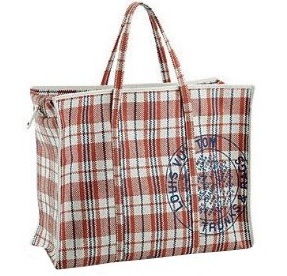 The Telegraph did a story on this bag, calling it "the bag of the uprooted" and "the modern equivalent of the battered leather suitcases piled high at the Ellis Island museum." And then the high-end fashion designers got a hold of it. 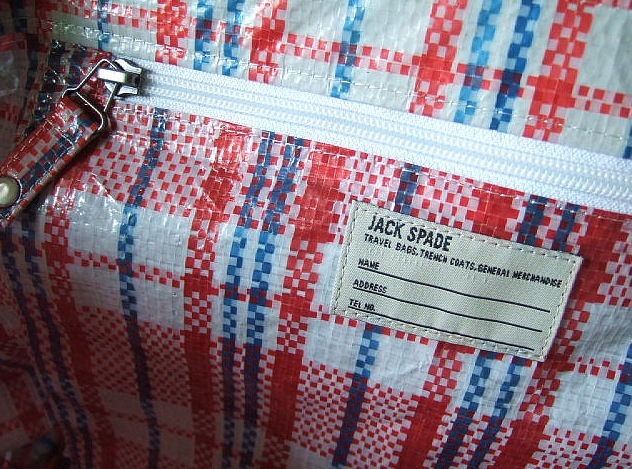 Jack Spade knocked it off--selling an $85 version called the Canal Street Coal Bag, along with matching accessories like iPhone cases, luggage tags, card holders, and New Era ball caps. Louis Vuitton knocked it off, too, calling it the Street GM bag--selling for around $600. And then that knock off was knocked off. 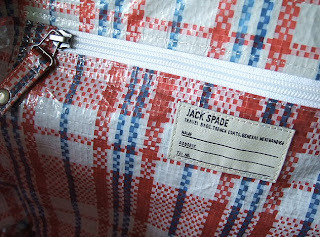 As the people most closely associated with this bag--immigrants, elderly, poor--are being replaced by the young and affluent in Manhattan, the bag is literally changing hands, morphing into a status symbol for the rich and their aspirants. But did the replica of Louis Vuitton's replica of the Chinatown bag ever sell on the streets of Chinatown? A middle-class simulacrum of a luxury simulacrum of the low-end real thing returned to its roots? Thinking of this the day after the Punk: From Chaos to Couture Met Ball, where "Miley Cyrus, Anne Hathaway and Cameron Diaz were among the celebrities to embrace the punk theme" and "Sarah Jessica Parker donned an oversized feather mohawk by Philip Treacy that complemented her graffiti-splashed and slashed gown by Giles Deacon, which she also paired with custom-made, thigh-high, tartan-plaid Christian Louboutin boots." The show at the Met includes a reproduction of the piss-filled bathroom at CBGB's. crazy sh*t the branding. Those bags are the just that! Moving, these are the new box. Price is right and the reuse feature is extraordinary. 99cent stores everywhere. Where there is a 99cent store. Three sizes. I stick with the plaid but have seen some new designs at UWS Amsterdam between 88 and 89. I mostly buy mine everywhere in Bed Stuy. I always thought of these as laundry bags. They're great for moving and storage. It's called "Uncle Waltie's laundry bag". Happy to have set the record straight. So glad they included the piss in the re-created bathroom. Hope at least some was on the floor for the sake of verisimilitude. Judging by the backroom at my dropoff laundry, they've been replaced by Ikea bags. the bags are ugly, end of case. i dont like plastic or plaids. i always carried a large brown/maron color straw bag for laundry. it maybe was made of nylon but looked like japanese laquered baskets. thank you for sharing what the tasteless masses like, & will pay hunrads of $$$ for. i have seen that clip before from youtube. it reminds me the bret ellis novel, the horrible one i wouldnt read. Still used a lot around here, by old & newer residents alike. Very useful for laundry, groceries etc.- I have a bunch. 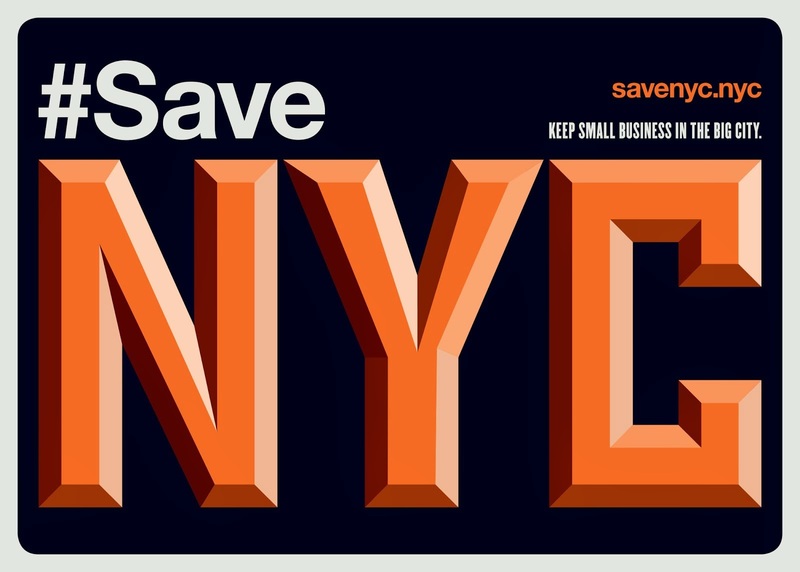 Yes, if there are 99c cent stores near you, you'll see them a lot. Many of the kids at the residential home where I work move in with their clothes etc. in black garbage bags ... a good deal sadder than using these plaid ones. I used to work for the Met decades ago. Back in the day the "Met Ball" used to be open to the public, anyone could buy a ticket. I bought one for $60 with my staff discount. Now it's a celebrities-only event, with tickets costing between $5000 and $15,000. It's turning museum culture, which should be open to everyone, into celebrity culture, excluding "common folk". The Costume Institute used to be a department devoted to the history of clothing. Now it has become just as exclusive, snobbish, and difficult as a fashion magazine or fashion house.